St. John stands, head turned to the left, looking upward. Behind him to the left a landscape suggests that the Saint is on the Island of Patmos. 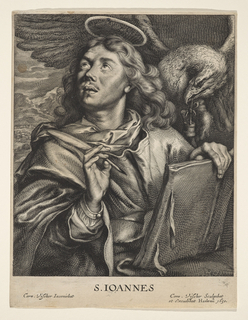 In his right hand he holds his pen poised to write the apocryphal Book of Revelations, which he holds in his left hand. Behind him, at right, flies his attribute, the eagle that carries the ink pot in his beak and protects the Saint with his outstretched wing.